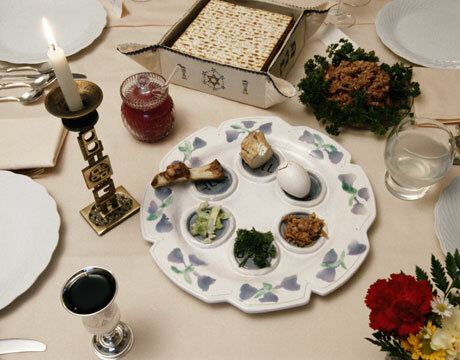 Every year the Jews celebrate the Passover with a ritual that is called the Passover Seder Which commemorates the Israelites exodus from Egypt thousands of years ago. This is found in Exodus 12, Numbers 9:9; 28:16; Dt. 16:1. At each plate, we had a Haggadah, (which Hebrew means: “the telling”) the book narrating the Passover. Partaking of the different foods, all that each represented, was so very special. One of the most interesting foods at the Seder is the aphikomen (that which comes last, the hidden Passover bread eaten at the seder). I will try to explain a little about that: the father of the house who is leading the seder, takes three wafers of unleavened bread (may use matzo). He bypasses the top wafer, takes out the middle wafer, and breaks it in half. He puts one of the halves back with the top wafer. He then wraps the remaining piece of this middle matzo in a white napkin or puts it into a special, while, silk bag. While the children cover their eyes, he hides or “buries” that portion of the middle matzo, usually beneath one of the pillows or under the tablecloth. This buried or hidden wafer of unleavened bread now has a name, aphikomen. This middle piece of matzo won’t be seen again until the end of the service. With the dinner at an end, and all the dishes are cleared away, the children now search for the missing aphikomen, making a game of it. The children are very excited and the one who finds it will receive a reward for it – a small gift or sum of money. At the Last Supper, Yeshua (Jesus) made the significance of that broken matzo very clear when He instituted the new memorial to commemorate the sacrifice of Himself as the bread of life, the Lamb of God, the ultimate means of redemption for both Jews and Gentiles. Therefore, the words, “In memory of the Passover Lamb,” spoken over the aphikomen in the seder, present a double symbolism: The middle wafer represents Jesus, the Messiah, who, by His sinless, perfect life, fulfilled the prophetic symbolism of the unleavened bread, and who, by His sacrificial death, fulfilled the prophetic symbolism of the Passover lamb! We see in the three pieces of matzo on the Passover table, a truth that remains hidden from most of the Jewish community to this day. That truth of the unique unity of the eternal God is expressed in the Shema (Deuteronomy 6:4). The middle matzo is singled out, representing the Messiah, even as He was foreordained to die for the sins of the whole world (Psalm 22, Isaiah 53, Daniel 9). The middle matzo is broken, signifying His death, for He was crucified. The middle matzo is also hidden, perhaps symbolizing three days, we “resurrect” the middle matzo, just as Jesus the Messiah rose from the grave in fulfillment of Job 19:25 & Psalm 16:10. That new memorial of the death, burial, and resurrection of Jesus the Messiah symbolized the fulfillment of God’s plan for the full redemption for all mankind, which was foreshadowed in the first Passover observance. At the end of the seder, the father sends the children to the door to see if Elijah is coming to answer the prayers. They were all so excited, but of course, Elijah isn’t there when they open the door. A place setting is left empty for him along with an empty chair, awaiting Elijah’s return as the one that comes just before the Messiah (which John the Baptist was referred concerning). The service is ended by the reading of the Great Hallel Psalm (which is Psalm 136), a Psalm concerning the arrival of the Messiah, which the people sang as Jesus entered the city four days before His crucifixion, as He fulfilled the prophecy of Daniel 9:25. The Passover Seder is quite long, but educational and enlightening. To help you better understand the Passover, I would like to suggest you get information from “Jews For Jesus,” “Zola Levitt Ministries,” or some other Messianic ministry, which explains this beautiful celebration of the feast which as it relates Messiah Yeshua has fulfilled. If a “Jews For Jesus” missionary comes to your area to explain this or any of the Jewish Feasts as they relate to Messiah Yeshua, it is well worth your time to attend. They do an excellent job.